This court complex starts functioning with effect from 1984. This court deals with Criminal, Civil, MACT and Guardian & Succession cases relating to the area within the jurisdiction of the aforesaid District. 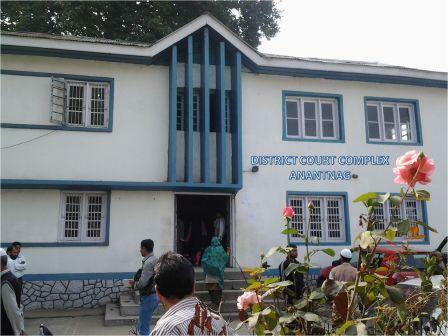 The Legal Aid Services started functioning in this court under the Chairmanship of Principal District & Sessions Judge Anantnag with effect from 1997. The foundation stone of the ADR Centre (Alternative Dispute Resolution Centre) in the court complex was laid by Hon’ble Mr. Justice Aftab Hussain Saikia Former Chief Justice of J&K (Patron-in-Chief J&K State Legal Services Authority) in the august presence of Mr. Justice F.M.Ibrahim Kalifulla Judge High Court of J&K, Mr. Justice Mansoor Ahmad Mir Judge High Court of J&K (Chairman Mediation Monitoring Committee High Court of J&K) and Mr. Justice Muzaffar Hussain Attar Judge High Court of J&K in the year 2011 which has been inaugurated by the Hon’ble Mr. Justice R.M.Lodha Judge Supreme Court of India in the august presence of Hon’ble Mr. Justice M.M. Kumar Chief Justice of J&K (Patron-in-Chief J&K State Legal Services Authority), Mr. Justice Virender Singh Judge High Court of J&K (Executive Chairman J&K State Legal Services Authority) and Mr. Justice Mansoor Ahmad Mir Judge High Court of J&K (Chairman Mediation Monitoring Committee High Court of J&K) in the year 2013.